Kevin, glad that method worked. Going to be trying it myself in a day or two. As an update, I tried the "Supafiller" Rowan suggested, mixing talcum powder with CA glue. It works wonderfully well. It's quick drying and although I can still see the seam, it's completely smooth. The real test of course will be priming the model, but I'm confident at this point I won't have to touch it up. Thanks for the advice, everyone. I'll give it another go during my days off of work this week. Kevin, I feel your pain. Small seam lines always are the hardest to deal with. Squadron Green or White putty just doesn't work very well in that situation. It's not that it doesn't fill the recess, it does, but wet sanding removes the top layer and some of the recessed layer, so that you have either the same indent, or it's slightly less, but you still have it. 1- I thin Squadron Green stuff with Tamiya Xtra Thin glue till it's a very soft like paste. Then using a small flat dental or sculpting tool, I apply small dollops to the seam and really push it in. Let dry and repeat. Let dry and dry sand. Even when I polish that seam, I don't use wet paper, as I'm concerned that the water will dissolve some of the Green stuff. 2-Thick Super Glue. Again, I apply it in dollops, smooth. Let dry, then a 2nd coat. Let dry, and wet sand. Regular Super glue is usually too thin to fill anything but a scratch. Several coats are needed. Never tried the Talcum powder method, but it seams that it makes the Super Glue thicker as well. A option I will have to try myself. 3- As Jessica alluded to, you can always use stretched sprue or plastic rod to fill slightly deeper seams. I've used this method many times. Sand when dry, then a coat of my thinned green stuff to finish off the procedure. 4- I've also used Tamiya's regular Gray Primer straight from the bottle applied in a few heavy coats. Fills small seams and scratches as well. Just take your time, repeat as necessary. All plastic joints that were joined with plastic cement will have some melting of the plastic. When you don't get it to bubble up, there is usually a concave seam left to deal with. Believe me I know. I'm an expert at getting that concave seam line. My favourite filler for tasks like this is a trick I learned in the early days of Armorama - probably the best tip I've ever picked up! - "Supafiller" (a mix of superglue and talcum powder). 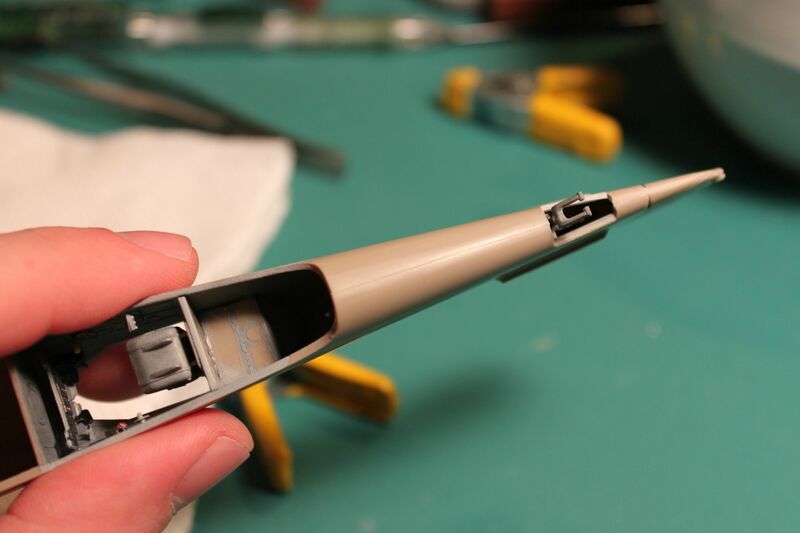 Neat superglue works as a filler too, but the resulting joint is often harder than the surrounding plastic. The beauty of "Supafiller" is that it dries quickly, doesn't attack the plastic (but don't use it on clear parts - it'll fog them), doesn't shrink and is easy to sand - and, importantly, is about the same density as styrene. Basically, pour a drop of superglue onto a palette and mix in some talcum powder until it has the consistency of toothpaste. I apply it with a toothpick and it sticks like the proverbial "poo to a blanket". You can quickly build it up in layers for major modifications. Ok, I tried that last night, now the seams on the bottom of the fuselage are slightly less noticeable, but still visible enough to bother me. Should I try to use Mr. Surfacer to fill in the gaps? Mr Surfacer will fill the gap very well. Or you could use Liquid Putty from the same company.. A bit finer..
Give it a shot and see what happens. You may need to resort to more aggressive fillers if it doesn't work. The trick with eliminating seams is being persistent. Sometimes the plastic is just like that, regardless what you've done or not done. Try gluing a piece of stretched sprue along the seam line in the indentation and sanding it flush after it's dry. I've run into a little problem on my La-7. There's still a noticeable indentation where the parts meet. It's a bit difficult to see in the picture, but I can feel it when I run my finger over it. Is there something I'm doing wrong? And what's the best way to fix this? Thank you! Actually Mr Surfacer is a heavy surface primer with filling properties. Depends which grade you are using.. Watching with interest and I'll be trying out these techniques on my next build. Just one question, what is Mr Surfacer? And do you sand it back after applying? I've never come across that product in any model shop here in the uk. Yes Stephen you need to sand back the excess. It is basically liquid putty. Sometimes you can remove the excess using cotton buds soaked in methylated spirits or alcohol. I think I may have found the perfect putty. It is from a place called deluxe Materials and is called Perfect Plastic Putty. Water to clean up and dries very fast. All you do once it is dry is put some water on a cotton bud and rub gently. All you are left with is a filled seam. Brilliant!! Followed a link to this thread from a post on Armorama. Absolutely fantastic work and great techniques that really come to life the way you explain them. I bookmarked this thread and will absolutely direct others here as well because there is something here for everyone, regardless of experience. Thank you so much for sharing! your thread proves that sharing knowledge improves everyone! I've read stuff here that even after 15 years modelling never crossed my mind, ears or eyes before. If you have a few minutes take a little side junket over to my blog to check out how I do flush mounted nav lights. This too is a key to having a clean seamless finish. chapter to 'Reading the Seams thread. Like welding, you match the two pieces to be bonded together, then apply the rod to the two to melt them into one. Fit the pieces together, then using the liquid cement of your choice apply it along the seam. The solvent will wick along and into the seam. A little pressure to the compress the two pieces together will create the bond as each melts slightly forming the weld. Typically liquid solvents evaporate fast, so by the time you apply it to the separate pieces then try to put them together the "Heat" is gone and no solid or lasting bond is created. I think the Tamiya product is your better option. G'day Gerald, just wanted to say that I must have read this thread 20 times from start to finish and every time I get another little gem technique. Probably the most useful and informative single thread I've found yet. Also thanks to all of the other contributors here, you guys all ROCK. This is very informative. I have a couple of questions though. 1. When do you use the putty vs sprue? Just depends on the gap? That is a judgement call. Which ever is going to provide the best results. If the area is structural in nature or subject to any loads, then sprue is my first choice. If it is very small and cosmetic only then glazing putty. 2. 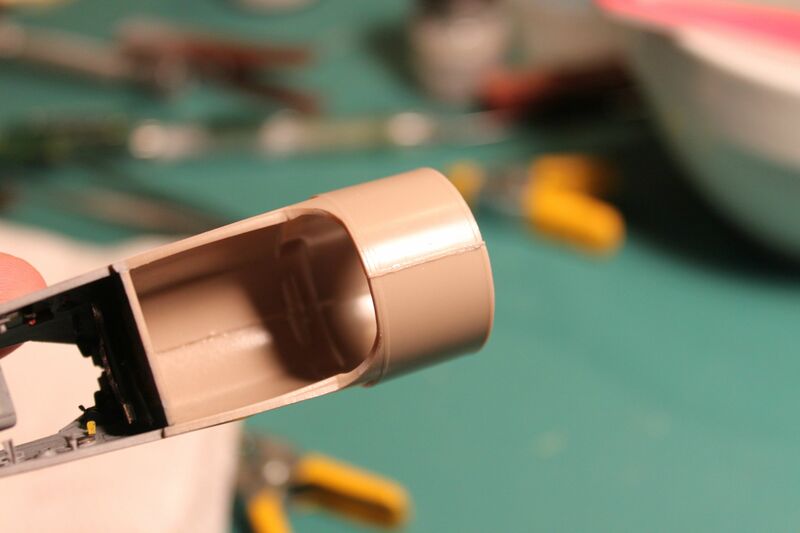 Do you only use the Mr. Surfacer to touch up the seams once you've used the sprue/putty to fill in a gap? Mr Surfacer serves both as a fine filler and a method to check the seam before painting. It also helps to color neutralize the area. That is to say if you use a dark colored filler it helps cancel the stark contrast between the surrounding plastic and the filler. The decision to use Mr Surfacer again is one of experience at Reading The Seam. Over time you'll know if you need it or not. But in the meantime the attage: When in doubt...use some Mr Surfacer.